The sim had its first public outing yesterday, resplendent with its new graphics, when the Marketing Team went to the Henley Show. We also took the Junior, so we had plenty to attract interest from visitors. The team was kept busy all day with queues of small children wanting to sit in the glider and older ones trying their hand at thermalling and aerobatting over the Scottish highlands in the sim. Chris Collett, Robin Willgoss, Bob Smith, Hugh MacDonald, Hedda Coture, Terry Clements, Hugh MacDonald and David Humphreys for a long Friday evening setting it all up and for an even longer Saturday on the stand. Also to Robin's wife for supplies of cakes and Roger Harris and Symeon Economou for getting the Junior derigged and ready to tow. After a successful visit last year, we were invited back to Oak Green School in Aylesbury this week to talk about gliding and show them one of our gliders. The afternoon consisted of two presentations to the pupils and then a walk round 319. As well as hopefully inspiring some future Booker Members the school have kindly donated £250 towards the cadet glider fund. Thanks to George for coming along to help. The day started full of promise and quite a few people set tasks and rigged and hurled themselves at the sky. It didn't turn out quite as planned but most people had a good time even if they didn't achieve their tasks. Meanwhile, there was plenty going on around the clubhouse. 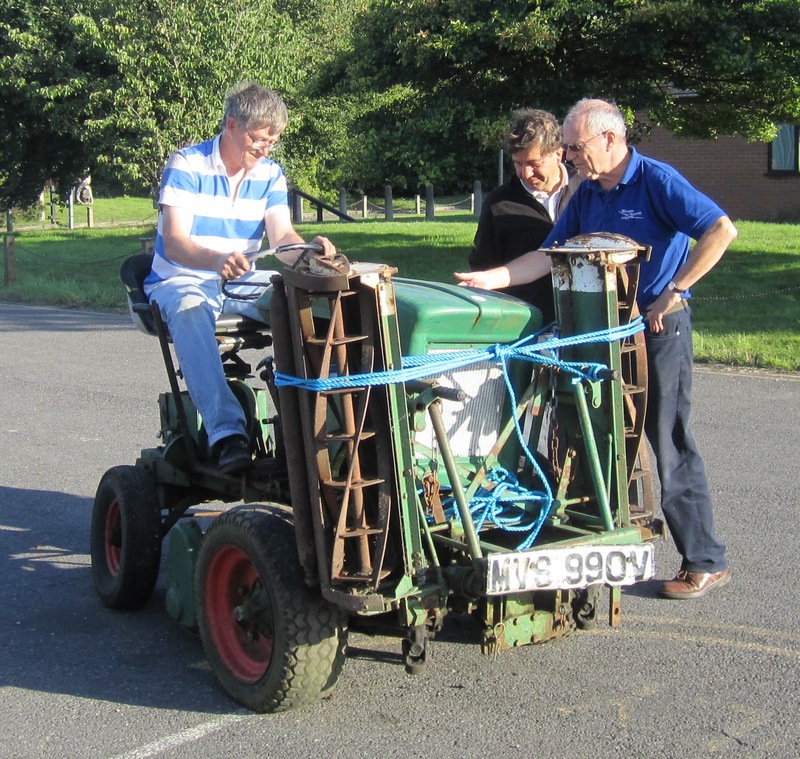 Rob Turner and his son Harry spent the day dismantling the gang mower he has bought (on ebay, where else?). The main achievements were to get the engine running and the wheels turning, but unfortunately not at the same time, and it had to be towed round to the hangar for a pressure wash. A bit more work though and it'll be cutting a swathe through the trailer park. Round the other side of the clubhouse, Chris and Hedda were hard at work applying graphics to the sim trailer, which we will be taking to the Henley Show next Saturday (12th Sept) along with the Junior. The trailer can't fail to attract attention, and we hope to have a full program of customers for the sim.